Late Sunday night, there is going to be a team leaving the Oxford Plains Speedway after the running of the TD Banknorth 250 with more money, one additional trophy and a lot more admiration from fans and competitors than he had when he woke up that morning. But there’s going to be a long road to victory lane. There will be 250 green flag laps, who knows how many caution laps and up to 90 laps of qualifying races for a team to even get to the finish. That’s all in one day as well and doesn’t count the optional two days of practice leading up to the race. And there are plenty of different approaches that can get a driver through those laps and to victory lane and plenty of race stories that will play out this weekend. In his last race, an IBG-PASS Pro Stock event at White Mountain Motorsports Park, Ben Rowe borrowed a car for Oxford regular Chris Kennison and won anyways. This week, he’s back in his #00 and trying to win his third consecutive 250. Living in the shadow a father like two-time 250 winner Mike Rowe has taught Ben Rowe to put things in perspective. Losing to his father isn’t something that Ben Rowe would be upset about either. 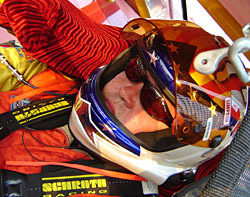 Only one driver, Ralph Nason, has won three straight 250s. Dave Dion has also won three of the races in different years, but nobody else has more than a pair of 250s trophies. Does this put a lot of pressure on Rowe? Not really. NASCAR Nextel Cup rookie Kyle Busch will run the 250 as a teammate to Mike Rowe in the #5 car of SP2 Motorsports. Busch got his first taste of the track on Tuesday as he tested out his car under the guidance of Rowe. The test went exactly according to plan. Johnny Clark found out last season that winning your heat races and leading the most laps in the 250 doesn’t make much of a difference if you get tangled up with a lapped car, so this season he’s adopting a different strategy – like the one Ben Rowe used to win last season. Of course, a good draw for his heat race could change Clark’s plans. Mike Rowe predicts that Busch will be tough to beat at the 250. Usually the veteran driver doesn’t say too much, so to go on the record praising Busch says a lot about the young driver’s ability. And even though Busch will be new at Oxford, getting up to speed shouldn’t be a major hurdle for him. The TD Banknorth 250 is a short track classic. Super Late Model drivers from all over the country know all about the race. 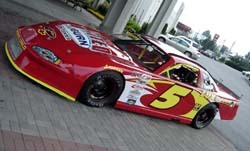 Thanks to the appearance of a few NASCAR Nextel Cup stars, the general public in New England is starting to know about the event as well. Last year, Matt Kenseth and Kurt Busch raced in it. This year, Kenseth returns along with Kyle Busch. In the week leading up to the race, exposure on Maine television and radio stations has been given to the race and articles have appeared in mainstream newspapers. It almost feels like a big NASCAR race is coming to town and that’s a great thing for short track racing. The competitors have noticed a difference. 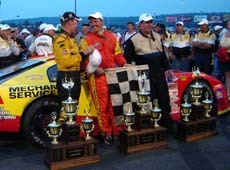 Ben Rowe won against a field of short trackers in 2003 and again in 2004 with two Cup guys in the field. “I’ve got videotapes of both of my wins and there is a huge difference,” said Rowe. “Two years ago, there were maybe eight or nine reporters around after the race. Last year, there were 50 or 60 people down there trying to talk to you. It brings a lot more attention to the race, so I think it’s great." It's so great in fact that the date for this season's TD Banknorth 250 was moved from a tradional weekend in mid July to July 31st, an off weekend on the NASCAR Nextel Cup Series schedule. When it comes to the TD Banknorth 250, just qualifying for the race is a chore. Johnny Clark might be one of the best Super Late Model drivers in the country, but he doesn’t take anything for granted when it comes to making the field through a series of heat races. “First we have to get in the race,” said Clark. “We’re all nervous about making it in. A spinning car on the first lap [of the heat race] coming out of four can ruin your day. I’ve been nervous about qualifying every year that I’ve gone to the 250. 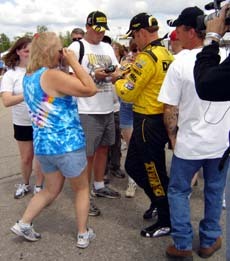 And those tough heats make the raceday very memorable for fans and competitors alike. “The bottom line is that you need to have a fast car and be mildly aggressive to even qualify,” said Oxford regular Andy Shaw. DO LOCAL GUYS HAVE AN ADVANTAGE? There are several camps of drivers who will be competing at Oxford, but it’s tough to tell who might have an advantage. 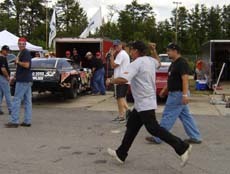 Touring drivers, mostly from the IBG-PASS Pro Stock Series, are used to long races and Oxford regulars know the track. Both camps have produced winners in recent season. Then there are the Cup guys. So just who has an advantage? SP2 Motorsports will run cars in the 250 for Mike Rowe and Kyle Busch. They have the makings of an Oxford superteam. But, team owners Steve Perry and Scott Pullen are just a couple of race fans who are happy to even be at the race. The possibility of winning it after competing with several different drivers for several years, is something else to them.